Avenida Houston is home to six hotels with easy access to downtown dining, sports, events and nightlife. Dine at one of many hotel restaurants, enjoy open-hair and rooftop pools, and relax with luxurious spa experiences. The Marriott Marquis awaits you with 1,000 rooms and an abundance of meeting space. A one-of-a-kind Texas-shaped lazy river, rooftop infinity pool, and special events pavilion overlooking Avenida Houston establish the hotel as a cosmopolitan oasis. The 29-story hotel offers 52 meeting rooms, a 39,000 square-foot ballroom and a junior ballroom, and 40 suites, including four vice-presidential suites and two presidential suites. 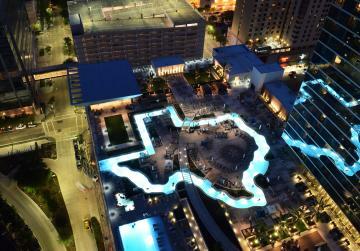 Its iconic, 530-foot-long, Texas-shaped lazy river pool sits 110 feet in the air surrounded by the downtown skyline. Six food and beverage outlets, including two specialty restaurants (one helmed by acclaimed chef Hugo Ortega) and a two-story sports bar dubbed Biggio&apos;s, offer guests a myriad of culinary choices and experiences. It is connected to the George R. Brown Convention Center via skybridge. With 1,200 rooms and direct connection to the George R. Brown Convention Center, the Hilton Americas is Houston’s largest hotel and, by many measures, its best. The 24-story, state-of-the-art hotel contains the city&apos;s largest number of guest rooms, ballrooms, hotel meeting space, and technologically-advanced services. The Hilton also offers a FedEx Office® Print & Ship Center, 1600 Bar+Grille, Pappasito&apos;s Cantina, and a Texas-sized Starbucks in the lobby. Hilton Honors members enjoy exclusive access to the R24 Executive Rooftop Lounge; with private concierge, breakfast buffet, evening hors d&apos;oeuvres, and stunning views of the Downtown Houston skyline. As the first Green Seal hotel in Texas, the Hilton Americas-Houston operates as an environmentally-friendly hotel. 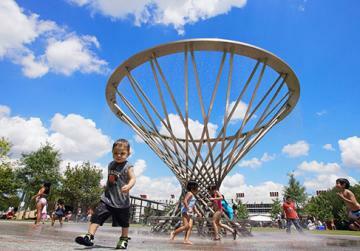 Embassy Suites was one of the first ventures to recognize the value of proximity to Discovery Green. Opened in 2011, the 252-suite hotel sits perched over the southwest corner of the park just two blocks from the George R. Brown Convention Center. The hotel features two-room suites with separate living areas, private bedrooms and wet bars, plus flexible meeting and event space, a rooftop pool and spa, 24-hour fitness center, the street-level Hearsay on the Green restaurant and two levels of underground valet parking. Of course, all Embassy Suites are known for their complimentary cooked-to-order breakfast each morning and manager’s reception each evening. The downtown Hampton Inn is centrally located to everything and it’s easy to see why travelers choose it for easy access to the George R. Brown Convention Center, Discovery Green, Minute Maid Park, Toyota Center and BBVA Compass Stadium. This property has all the bases covered: a free hot breakfast daily, free Wi-Fi in every room, a roofscape pool on the fourth floor with park views, free shuttles within the downtown area, a 24-hour business center and additional amenities made possible by partnering with Homewood Suites under the same shared roof. Homewood Suites, located in the heart of Houston, is within easy walking distance of the George R. Brown Convention Center and attractions such as Minute Maid Park, Toyota Center, BBVA Compass Stadium and Discovery Green. Hotel guests enjoy spacious one- or two-bedroom suites with a complimentary hot breakfast buffet daily. Other amenities feature enough space for work, study or entertaining, including a fully equipped kitchen with a full-size refrigerator, coffee-maker and microwave oven, two telephones with dataports and voice-mail.